Bridgepointe builds relationships, inspires action, and enriches the local community. Eighteen years ago, a small group of friends spent a day volunteering in a third grade classroom. In that Southwest Detroit school, as their eyes were opened to the staggering amount of poverty these children faced, they couldn’t help but be amazed by the kids’ kindness and optimism despite their circumstances. They realized then just how powerful face-to-face engagement is in helping bridge understanding and foster mutual respect. Bridgepointe has grown exponentially, engaging with ten Detroit-based schools, activating thousands of volunteers, building friendships and helping fund enriching experiences these students otherwise wouldn’t have access to. Inspired by their experiences with Bridgepointe, volunteers have initiated new projects from reading programs, personal tutoring, career days and field trips, to travel clubs, the El Sueño project, and even a boy scout troop - the first and only one in the area. Through these school-based projects we have not only helped provide school supplies and unique educational opportunities, we have built long-lasting relationships with the students, teachers and principals of these schools. "It’s a lot, what we receive, and it allows us an opportunity to help other families who also have few resources." For Bridgepointe’s next initiative, we are going back to our roots and focusing our efforts on the entirety of one ten block neighborhood in Southwest Detroit, including our continued engagement with our first school, Neinas Elementary. 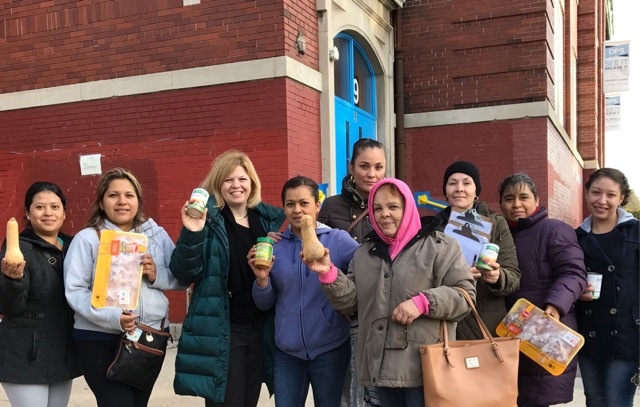 We're creating safe public spaces, building out a food pantry, and fostering a long term collaborative relationship with the area's local residents. As this new project gets underway, it is important to us that the communities we engage with understand our commitment to building a relationship that is built on mutual respect and understanding. As we move forward, we hope to inspire and partner with ever more of our neighbors and local businesses in an effort to build a better connected, fuller and richer society.